Josh Beckett certainly deserved a better fate last night against the Orioles. He pitched eight solid innings, but had just one bad one: the sixth, where he gave up three straight hits, and Baltimore went on to a 2-1 win. Beckett struck out five and walked none, as he continues to pitch well since the Cleveland debacle. The Orioles had only two runners get past first base all night, and they both scored. The Sox scored their only run in the third, on a sacrifice fly by Mike Aviles. They had opportunities late in the game, especially in the 7th, but after bunting runners over to second and third, Marlon Byrd struck out and Aviles popped up. The Sox could do little with Wei-Yin Chen, the rookie lefty who had gotten hit hard his last two times out but has had an overall impressive rookie season. The Red Sox have now dropped three straight, seven in a row to the Orioles at home going back to last season. They are 27-27, and four back of Baltimore. 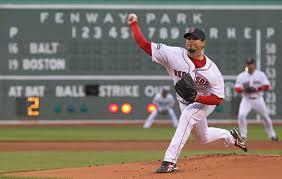 It's up to Clay Buchholz tonight to try to salvage the series and end a few losing skids.